WOW! Heck Yes! I would love to have my Spindrift on your website! 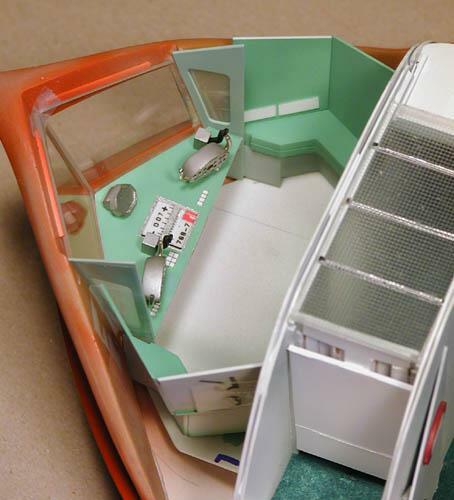 The kit was a vacuform model from Lunar Models. The 1/35 scale SPINDRIFT kit is about 16 inches long and came only with 13 parts total: 3 vacuformed parts the bottom, top, the top of the engine/restrooms area, a resin fin, cockpit window frame work, rear and foward engine vents ( which I did not use ) entena and a clear astro dome. 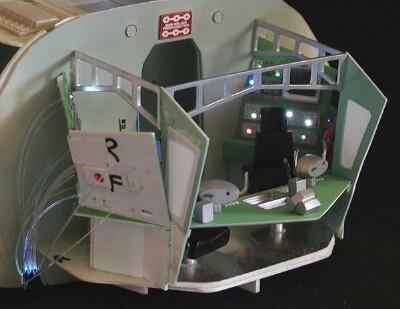 The rest of the interior was built by me watching many Land of the Giants on tape. ( My two young Girls loved it! ) 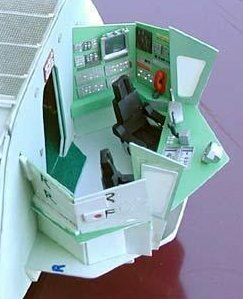 The interior kit ( which is sold seperatly ) was the older version and very rough so I scratch built about 95% of the interior. The engine cooling / intake grills and engine rear ports were made from aluminum stereo cooling grid that I drilled out just a tad more to fit the kit and l left it unpainted....The Spindrift on the SET had steel or aluminum intake grills...but it seems that the smaller scale studio models grills were painted black. I built my SPINDRIFT as the full size 'SET' version. If POLAR LIGHTS would have re-released the old AURORA SPINDRIFT kit any sooner I would have done all the SAME work to that model kit as well....I could never bring myself to pay up to 300.00 for that older Aurora kit on EBAY....now I'm very glad I did not! 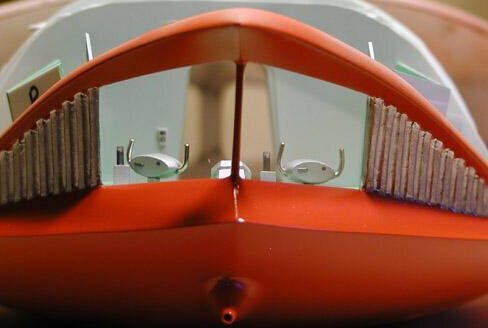 I just stumbled onto your "LOTG Spindrift" model while surfing modeling sites and was very impressed, indeed! My name is Peter Chelemedos, from Santa Cruz, CA. 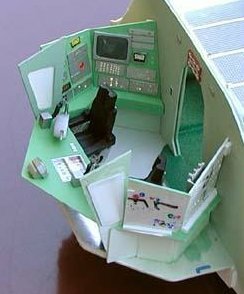 I am the person who ORIGINALLY pencilled the Lunar Models "Spindrift Interior Kit " instructions for Mike Evans waaaaaay back in 1991! The reason I took that assignment was because the original drawings by Jim Kreegar were barely legible pencilling and I arraigned with Mike Evans to do the "cleaned up" drawings, which were then sold with the kit. Needless to say, during that project I became TOO familiar with dear old "Spindrift". I also had the privilege of picking Gary Conway's memory while working on that project. My drawings were somewhat crude (I hadn't gone on to ACAD yet ), and I suspect that they've since been re-drawn (at least I HOPE they have!). 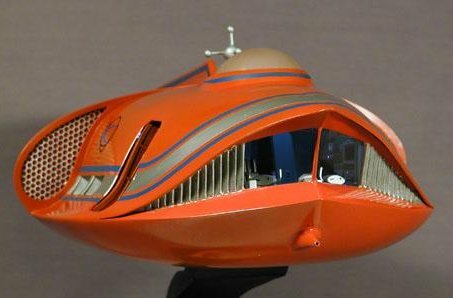 Now for my reason for this e-mail; I LIKE YOUR SPINDRIFT BETTER THAN I DO JIM KEY'S PROTOTYPE! EXCELLENT WORK!!!! !